When it comes to candy packaging, I am a shallow, shallow person â€“ particularly around mint-type candies. If it comes in an awesome tin, I am all over it, to the point where I have a pretty impressive collection of mint tins accumulating in my desk drawer at work. I am never in my entire life going to have enough tiny widgets and gewgaws to fill all those tins â€“ and yet, again and again I find myself buying candy of questionable quality because it came in awesome and potentially reusable packaging. Like the other day, when I was skimming the shelves at London Drugs looking for discounted Easter candy… and something else caught my eye: a rack of Yogen FrÃ¼z Smoothies tins. The clean, modern design of the tin, its colors just evoking the blue and pink of the Yogen FrÃ¼z logo… its use of the Ã¼, which doubles as a happy face, as a design element… its paltry price of $1.79. Half-price chocolate bunnies aside, I knew I had to have one… quite possibly in every flavor they came in. I managed to settle for just Strawberry Banana. The clean, spare packaging, while attractive, does somewhat resemble a diet product rather than a candy, and the tin is even sprinkled with buzz words like â€œall-naturalâ€ and â€œprobiotic.â€ (Those bacteria are some hardy little guys if they can survive in the dry, acidic environment inside a SweeTART-like candy.) And with no fat and only three calories a candy, these were starting to look less and less like they were aimed at the day-after-Easter-candy crowd, and more and more like they were aimed at the yoga-antioxidant-goji-berry crowd. But hey, if they actually tasted good, theyâ€™d be as close to a guilt-free candy as you can get. The candies do indeed resemble SweeTARTS â€“ theyâ€™re little round compressed-dextrose discs, in this case a very pale pinky-purple, embedded with the signature â€œÃ¼.â€ Texture-wise, theyâ€™re not actually very much like SweeTARTS or other mints Iâ€™ve had â€“ the texture is a lot softer, almost crumbly, quickly disintegrating into little gritty bits with a texture Iâ€™m really not crazy about. Flavor-wise, theyâ€™ve definitely got a yogurty tang to them. Theyâ€™re pretty sour, but not really in the good way. The strawberry banana flavor actually kind of unpleasant â€“ itâ€™s got that same so-sweet-itâ€™s-sour aftertaste as some artificially sweetened things do, even though thereâ€™s only real sugar in them. Combined with the sour taste of the yogurt, it brings to mind underripe strawberries and that bitter white stuff inside a banana peel rather than the sweet, mellow interior. In all, they donâ€™t remind me of candy so much as they do some fruit-flavored chewable multivitamins I had as a kid â€“ itâ€™s like the fruit flavorâ€™s only there to cover up the bad taste of the stuff thatâ€™s good for you, but the fruit taste only combines with the medicine taste for a new level of badness. So I got my cute tin this time â€“ but a whole lot of not-so-good candy to go along with it. Did I learn my lesson? Definitely… at least until the next shiny new thing comes along. this is what candies should be……all about….natural. 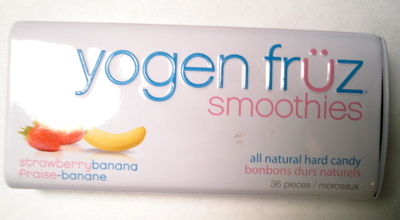 i love yogen fruz candies and you will too…..
I’ve had these, and I thought they were DISGUSTING. Like Tums, only worse.